Sip-sip Hooray. 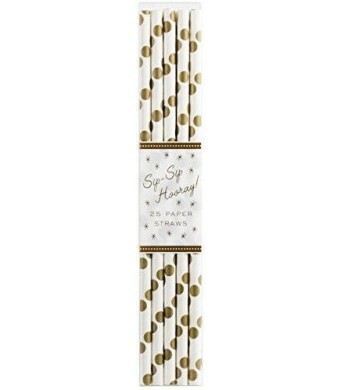 Retro-look super strong paper straws are 100% recyclable, but won't get soggy. Made with food safe paper, these fun straws will turn your party drinks into entertaining, flirty beverages and won't harm the Earth, something we can all celebrate. Each box comes with 25 straws, each 7.75 long, made for sipping' and slurping' in a variety of festive colors. Party Partners Design makes your party more than a party, it becomes the event of the year. Let us do your party a favor. A vintage-inspired collection of time-tested classic party supplies. Party Partners' festive decorations have been regularly featured in magazines such as Good Housekeeping, Cookie, Parents, Country Living, Martha Stewart Kids, Martha Stewart Weddings and Better Homes and Gardens. Kooky old-fashioned party supplies and party favors, let the party begin.